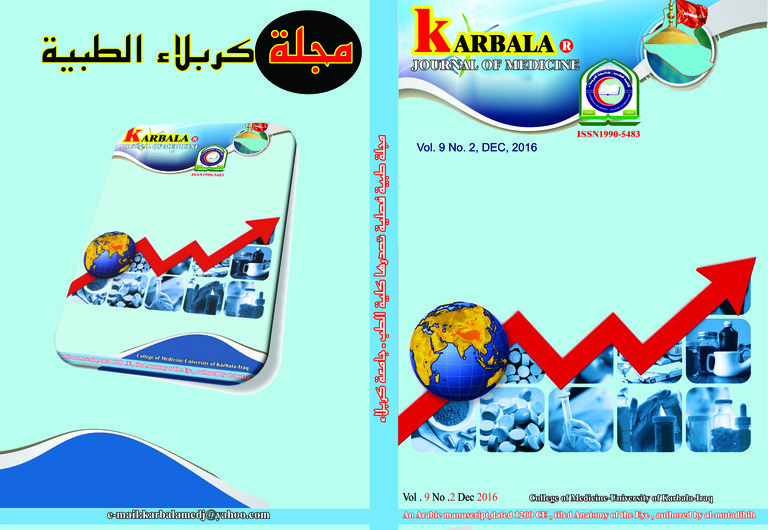 Karbala Journal of Medicine is a four monthly published journal issued by Karbala college of Medicine.The Journal accepts original articles, case reports, and letters to editors in all fields of medicine from all parts of the world. Review articles of high standards are also considered in this journal. All articles and manuscripts must be in english ,only the abstract must be in arabic and english.Papers are accepted, on understanding that the content has not been published in a whole or in part by other journals. The papers are subject to editorial revision, and the editor is responsible for the order of publication.Manuscripts are only accepted on the understanding that the author will permit editorial amendments, though proofs will always be submitted to the corresponding author before being sent finally to press. The Journal is peer- reviewed and each article is sent to two evaluators of the same specialty in addition to statistical and design review by expert statistician. Date of first issue(2009) No: of issue per year(4) No. of pages per issue(120) No. of issue published between 2009-2012) is(16) مجلة كربلاء الطبية مجلة فصلية تصدرها كلية الطب جامعة كربلاء.تقبل المجلة المقالات الطبية الاصيله, التقارير الطبية ورسائل الى المحرر. كما تقبل المحلة مقالة المقالات ذات النوعية الممتازة.جمبع المقالات في المجلة تخضع لمراجعة المحرر والمحرر هو المسئول عن اعطاء امر النشر.لاتسمح المجلةبنشر مقال منشور جزئيا او كليا في مجلات اخرى.تصدر المجلة اربع اعداد في السنة.عدد الصفحات في العدد حوالي 120صفحة. اول عدد صدر في 2009. Al-Anbar Medical Journal is a Periodic Peer-Reviewed Journal Published Biannually by the Anbar Medical College. The journal welcomes original articles, and case reports in all fields relevant to medicine. Review articles are usually by invitation only.Only English language is accepted with an Arabic abstract. مجلة الانبار الطبية هي مجلة دورية محكمة تصدر عن كلية الطب جامعة الانبار وتنشر أعدادها بمعدل مرتين في السنة.المجلة ترحب بالبحوث الأصيلة والمقالات وتقارير الحالات السريرية في جميع المجالات الطبية والتي تعنون إلى رئيس التحرير. تكون المقالات الخاصة بالمراجعة الطبية عادة عن طريق توجيه الدعوة فقط. تقبل البحوث باللغة الإنجليزية فقط مع ملخص باللغة العربية.